A CT scan works similar to an x-ray. The body casts a "shadow" on film when it is exposed to the x-ray, much like when you hold a flashlight up to your hand and cast a shadow on a wall. All of the tissue that the x-ray passes through overlap on the image, making it hard to isolate different elements. A CT scan works around this limitation by capturing one narrow slice of your body at a time. Inside the CT machine, the x-ray tube circles around the patient taking pictures as it rotates. These slices can be viewed two-dimensionally or added back together to create a three-dimensional image of a body structure. A dye (contrast agent) may be injected into your bloodstream to enhance certain body tissues. The dye contains iodine, a substance that x-rays cannot pass through. It circulates through the blood stream and is absorbed in certain tissues, which then stand out on the scan. CT angiogram (CTA) can be used to view arteries and veins. Contrast dye injected into the bloodstream helps the computer "see" the vessels. CTA images can be 3-D reconstructed so that the cerebral vessels and accompanying pathology can be rotated and viewed from all angles. CT scans are very good at showing bone, soft tissue, and blood vessels (Fig. 1). While an MRI takes excellent pictures of soft tissue and blood vessels, a CT scan shows bone much better, so it's often used to image the spine and skull. It's also used to view the inner ear and sinuses because these areas are made of very fine bones. Figure 1. 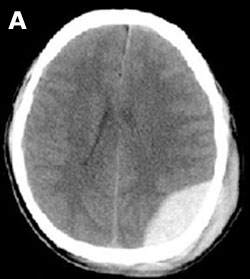 A, CT scan of the head showing a hematoma caused by an injury to the back of the skull during a car accident. 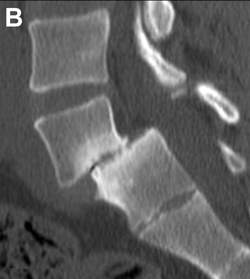 B, CT scan of the spine showing slippage of the vertebra out of alignment (spondylolisthesis). 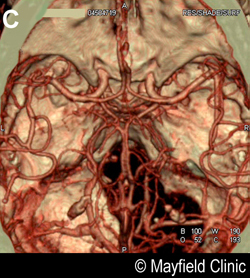 C, CT angiogram of the blood vessels in the brain. A radiology technologist will perform the test in the CT suite of the Radiology department of the hospital, or at an outpatient imaging center. You should wear loose clothing and remove all objects that would get in the way of the scan, such as hairpins. You may need to change into a hospital gown, depending on what part of your body is being imaged. Be sure to tell your doctor if you've ever had an allergic reaction to iodine contrast. You will lie on a moveable table. If your head is being imaged, the technologist may position your head in a special head-holder that keeps it from moving. When you are comfortably positioned, the table will slowly move into the CT machine that looks like a large square doughnut with a hole in the middle (Fig. 2). The technologist will stay in constant contact with you over an intercom. While each picture is taken, you will be asked to hold your breath and stay perfectly still for a few seconds. The technologist will move the table with a remote control after each picture is taken. You may be given an injection of contrast dye into your arm or through an IV to enhance the images. Figure 2. The CT table slides into the donut-shaped gantry where the x-ray tube rotates taking pictures of your body in slices. The machine may be quiet or noisy, depending on the brand. The noise you hear is the x-ray tube rotating around your body to produce the images. You will not feel any sensation from the scan. The scan can last from 5 to 15 minutes. After the test, the IV will be removed and you are free to go. You may be told to drink lots of fluids to help your kidneys remove the contrast dye from your body. There is a slight risk from X-ray radiation exposure, and some people are sensitive to the contrast agent. The most common side effects from the contrast are a brief metallic taste in your mouth and a feeling of warmth throughout your body. An allergic reaction to the contrast can cause severe hives and difficulty breathing. Medications such as antihistamines can reverse this reaction. If you have diabetes or kidney problems you may experience kidney failure, but this is very rare. Be sure to tell you doctor if you are pregnant or have allergies (to medications, previous iodine injections, or shellfish), diabetes, asthma, a heart condition, kidney problems, or thyroid conditions. The radiologist will promptly review your images and communicate directly with your referring doctor, who in turn will discuss the results with you. contrast agent: a liquid (usually iodine or gadolinium) that is injected into your body to make certain tissues show up clearly during diagnostic imaging (angiography, CT, myelogram, MRI). 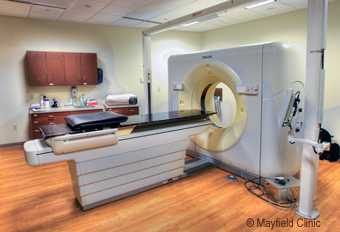 MRI (magnetic resonance imaging): a diagnostic test that uses a strong magnet to view tissues in your body and displays them in a series of slices. At Mayfield, we work with diagnostic imaging providers in the Greater Cincinnati-Northern Kentucky region to obtain images of the brain and spine and interpret them with expertise and care. Patients and referring physicians can rest assured that we will lay the groundwork for a diagnosis of utmost accuracy.